When you buy your new caravan or motorhome we aim to provide you with the best aftersales service possible. With this in mind, every caravan and motorhome has a 12 month Newport Caravan and Motorhome Care warranty. Our own Newport Caravan and Motorhome Care warranty is a no worry policy, the cover is extensive with only some exclusion such as windows, upholstery and curtains, tyres, brake shoes, frost damage, floor covering, work surfaces, TVs, bulbs, leisure batteries, wear and tear, accidental damage and misuse. **For further details please see terms and conditions below. 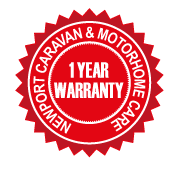 Any used Caravan or Motorhome supplied by Newport Caravans is covered by a Newport Caravan and Motorhome Care 12 month warranty. In the event of an issue with your caravan or motorhome you must contact Newport Caravans on (01633) 843066 Option 1, to report the fault. All repair work will be carried out by our highly skilled and qualified workshop technicians. We only accept claims from the person named on the attached schedule and we do not accept any responsibility if the caravan or motorhome has been given or sold to a third party. There is no limit to claims made during the lifetime of this cover. If you should be unfortunate enough to be away when you experience a problem with your caravan or motorhome, you MUST obtain authorisation from Newport Caravans before any work is carried out. All receipts and faulty parts must be kept in order to obtain a refund upon your return. Coupling heads, corner steadies, dampers, joints, wheel bearings, shafts, axle and handbrake mechanism. TV aerial, chargers, water pump, extractor fan, 240 volt and 12 volt sockets, microwave, radio/CD player, alarm. Cooker, grill, fridge, heating system, catches, window and cupboard stays, toilet and water pumps, chargers, damp, thermo couplings, microwaves, aerials, satellites, air conditioning. Water ingress through any sealed joint and floor de-lamination. Engine, gear boxes, clutches, drive shafts, axles, wheel bearings, cam belts, wiper motor, fuel pumps, water pumps, alternators, batteries, exhaust systems. a) Windows, upholstery, curtains, tyres, brake shoes, frost damage, leisure batteries, TVs, Bulbs, accidental damage, floor covering and work surfaces. b) General wear and tear and misuse will not be covered.